In May 2017 the West Midlands elected its first metro mayor, Andy Street for the Conservatives. He has control over the whole West Midlands combined authority area and works with existing city leaders to take forward their strategic plan. You can find out more about the new metro mayors on our FAQ page. West Midlands consists of the following local authorities: Birmingham, Coventry, Dudley, Sandwell, Solihull, Walsall, and Wolverhampton. Understanding how the city-region performs on key areas such as productivity and employment helps the new metro mayor to assess what he should prioritise. The table below shows how West Midlands compares to the national average on these indicators. What are the policy priorities for the West Midlands metro mayor? Signal an intent to keep West Midlands moving by retaining the M6 toll, the metro mayor should commit to use scarce funds on other transport priorities instead. Pledge to increase walking, cycling and taking public transport to work, commit to making other transport options more attractive and easy to use. Simplify ticketing across the West Midlands by fully integrating the Swift card and making it easier to use. Improve public transport with a strategic plan to make the West Midlands work as a single city region to live, work and travel across. Use the metro mayor’s profile and visibility to make the case for the West Midlands globally by leading trade envoys, establishing international networks between cities. Represent all industries, not just one or two key firms, to ensure that the broad range of businesses and workers benefit from exporting to the world. Encourage and enable exporters to be ambitious under the West Midlands brand and enhance this brand with the globally recognised firms already exporting. Encourage more key employers to work directly with schools and skills providers to give residents a second chance to access job-ready skills. Challenge firms to offer high quality in-work training to ensure workers are best placed to thrive, and firms are as innovative and productive as possible. Work with local universities, using them as a hub to improve the skills of local residents and businesses. What powers does the West Midlands metro mayor have? 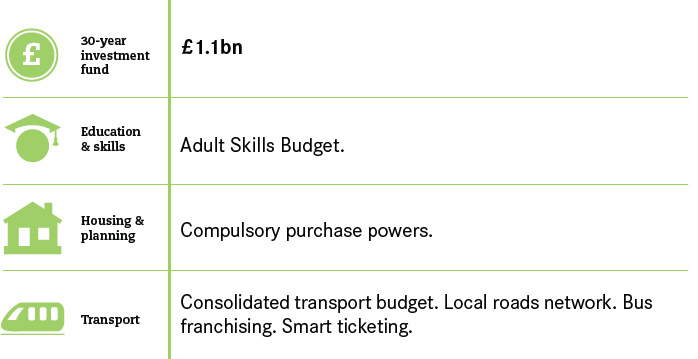 Below is a summary of the powers the new West Midlands metro mayor has. What is the political landscape in West Midlands?